1. In a large salad bowl, combine greens, cucumber, onion, and mushrooms. Toss with about 3/4 of dressing. 2. 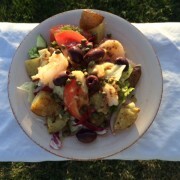 Divide salad on serving plates, and top with capers, potatoes, shrimp, tomatoes, olives, and avocado, if desired. Drizzle with remaining dressing. Preheat oven to 375 degrees Cut salmon into four 6 oz and set aside in a 9 x 13 inch baking pan. In small saucepan, combine apricot preserves, teriyaki sauce, vinegar, and ginger. Stir over low heat for about a minute or until preserves become liquid. Remove from heat. Add sesame oil, orange juice and orange zest. Pour 3/4 of sauce over salmon. Cover with tinfoil and place in oven for 20 minutes. While salmon is cooking, heat saute pan on medium high heat with ghee or olive oil. saute carrots until brightening in color. Turn heat to medium low and add rest of sauce. simmer for 4-5 minutes, or until carrots are tenderizing without losing color. 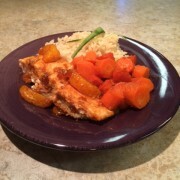 Serve carrots and salmon together with brown rice or quinoa. Delicious! Shred chicken breasts. To make dressing, add stevia, vinegar, water, oil, and salt in salad dressing shaker. Shake well. Wait to assemble until ready to serve: Wet the spring roll. 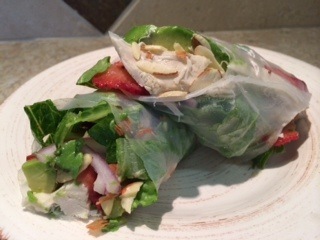 When bendable, layer with lettuce, chicken, strawberries, avocado, red onion, and almonds. Drizzle on a little dressing. 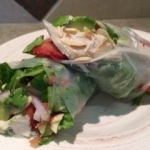 wrap up in spring roll skin. Cut on diagonal. Enjoy!